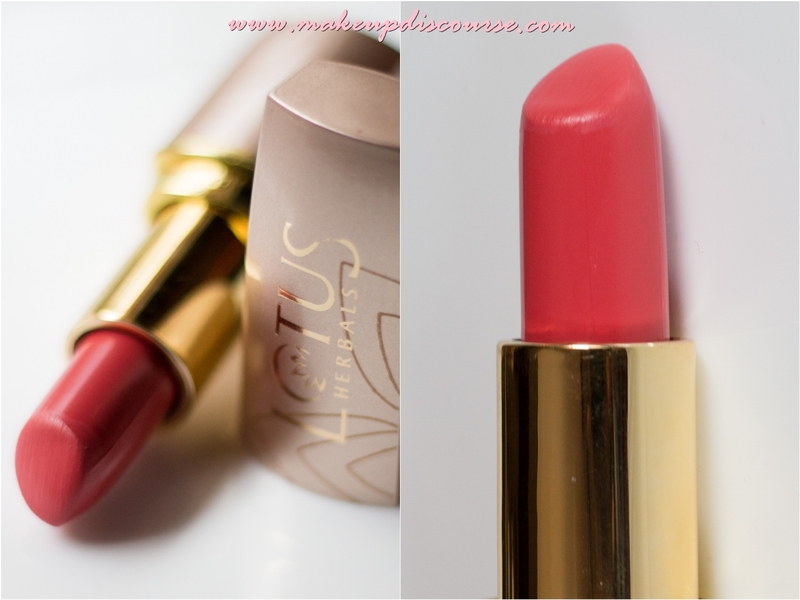 Lotus Pure Colours Lipstick in Carnation is a Rosy Coral colour with slight earthy/peachy tone to it. The Colour is semi-bright and is opaque in a single swipe. 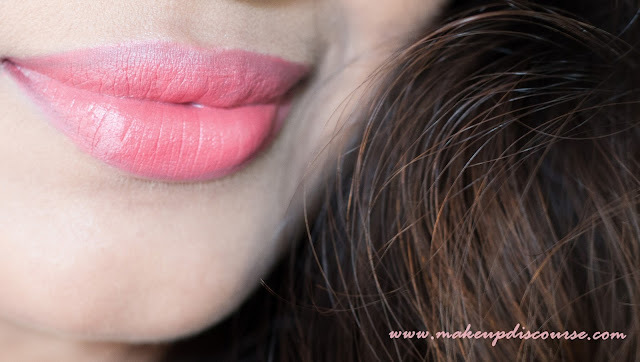 The base colour of this lipstick is Rosy Brown and the overlay is semi-bright Coral which adds vibrancy to this lipstick. After blotting with a tissue, the vibrancy is reduced to a soft rosy brown opaque tint. I prefer using both ways: Vibrant and blotted. But I feel the colour is intense and bright enough for day wear. Blotting takes away much of the vibrancy (and yellowness in Carnation), so make sure you soft blot it. I don’t like using Lip liners and hate the fact that you hardly find a match. So I basically use the bullet to outline and fill in the Lipstick. And with tricky textures, I use a lip brush to outline and filling followed by blotting and applying directly from the bullet. Outlined with Lipstick on Brush and filled in. Do you see the tides? 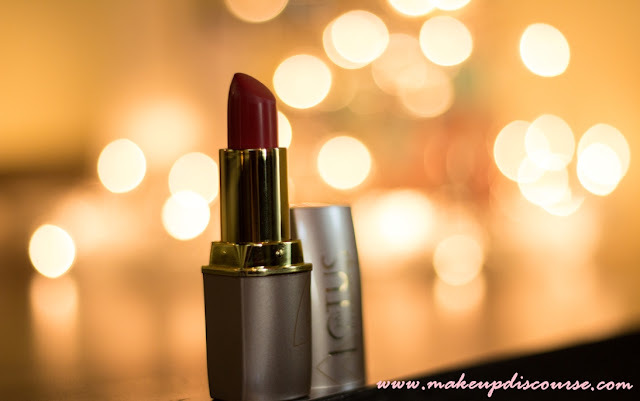 I love this Lipstick and prefer this when I have enough time to follow the needed steps to get it right. The formula is gross, it is creamy and slippy. The texture is hydrating and creamy on application. The creamy overlay slips and transfers when you press your lips and develops tide lines resulting in uneven application. It does not bleed. This Lipstick does leave a slight tint behind but if removed with a bi-phased remover or Bioderma, every trace of colour comes off. I don’t think there are many Pros or Cons to be listed down apart from the gross texture. Recommendation: I have not read any review mentioning the slippy texture that overlaps and forms tides in the outlines or corners of lips. I guess either this is manufacturing default or just a bad lipstick. I would try few more shades from the same range since they are affordable, I am willing to try a few more shades. I like the colour and I believe I can make it work. 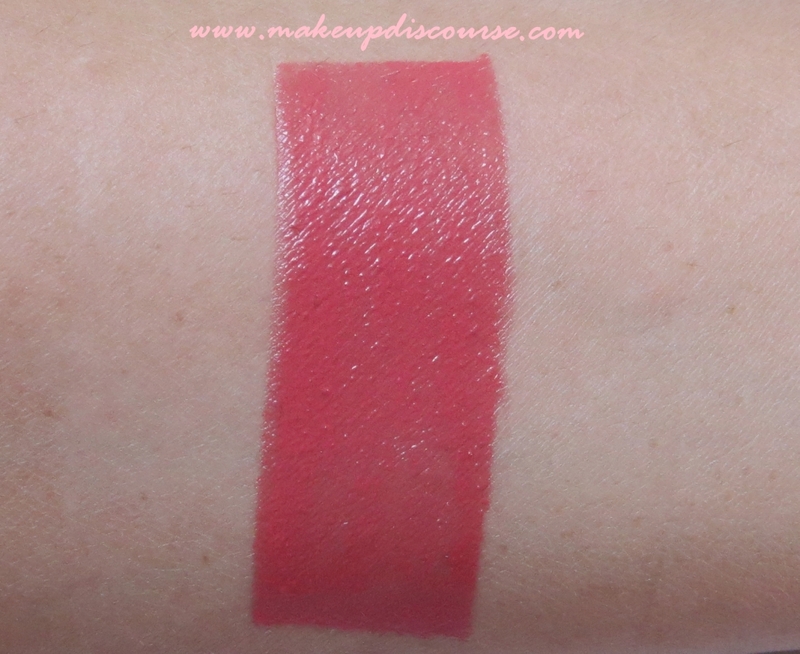 *All the swatches are clicked in Bright Daylight. :) They've been around for a while, looks like nobody cared to notice that these were vegan.